Thankfully, toymakers have our back, and there are plenty of big and small BB-8’s out there for us to buy. Or, you can always just make your own, like one ridiculously impressive teenager just did. Angelo Casimiro (who’s only 17 years old!) recently constructed a life-size workin’ and rollin’ BB-8. It’s also all controlled by his phone, just like the Sphero BB-8 version you can buy right this instant online. But there’s something amazing about building your own DIY version at home. 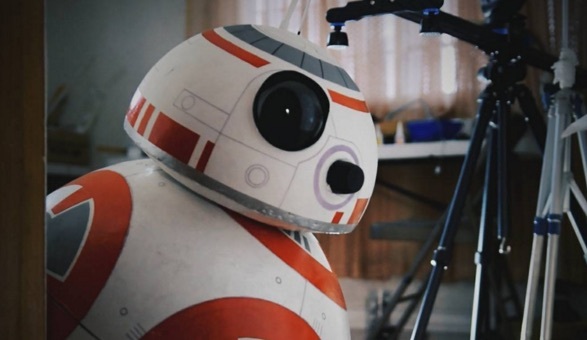 As he explains through a few lengthy YouTube tutorials (which you can watch here, if building a BB-8 is on your to-do list today) it’s completely made out of household objects. BB-8’s body? A beach ball. BB-‘s eyes? Christmas ornaments. He also used fiberglass, styrofoam, and roll-on deodorant, because obviously. In all, not including the cost of his own labor, making this BB-8 cost around $120. BUT TBH GETTING A BB-8 IS PRICELESS. Sharing on Twitter, Casimiro says he’s already working on a second version of BB-8, and this one will come with a taser and a lighter, for all future interactions with Finn, duh. Casimiro and BB-8 already have big Valentine’s Day plans, too. That’s amazing, because we’re already so in love with this as it is. We will most certainly be watching Casimiro droid building career with great interest.